As Spring is upon us and we are anxious to get out in our gardens to see what is popping up and making plans for what new plants we can add this year, let’s talk about an often forgotten layer in your landscape – the groundcover or Green Mulch Layer. I have written about it in previous posts but I think it is important enough to discuss again. So many times we plan a new garden bed, stick a few plants in the ground and then surround it with mulch -brown wood chips or even worse dyed wood chips. The plants are like little islands in a sea of mulch; never allowed to touch one another or socialize. Plants are social organisms that desire the companionship of their plants friends, even more than that, they depend on it for communication. My first suggestion is to ignore those plant tags “spacing requirements” and plant them closer together. A good rule of thumb is 12” apart (although I have been known to go even a little closer). The plants will be much happier as they can transmit beneficial information to each other, sharing information and resources such as “insects are attacking me”. Another disadvantage to these mulch seas or beds is by leaving all that open space you are susceptible to weeds coming in and taking over, increasing your maintenance — nobody wants to spend time pulling weeds! If you plant more densely, and use groundcovers to fill in the bare spots you will save a lot of time. By layering your plants in varying heights and structures you will begin to create more habitat, attracting natural predators to control the pests. You will begin to build an ecosystem that is not only attractive to our eye but to nature as well. Your garden will morph over time, the early established plants will out compete the weeds early on and will gradually allow the slower plants to take over. A few simple edits along the way will allow you to maintain an aesthetically pleasing garden. There are many plants that can be used as green mulch or groundcover and will suppress weeds, cover the ground and add interest to an otherwise barren sea of mulch. By using plants as mulch you will also be increasing the sources of pollen and nectar needed for a dwindling number of insects. These plants will spread by seed, rhizomes or both. Because they are quick to establish, low maintenance and have a low growth height they are the perfect choice for green mulching. Below is a partial list that North Creek Nurseries recommended for green mulch, which are also favorites of mine, plus a few of my own suggestions. In addition to reducing weeds in your garden, using these groundcovers can offer additional benefits in the natural areas of our community. Author Nancy Lawson, “The Humane Gardener” discovered by accident that Packera aurea Golden ragwort could be used to combat the dreaded invasive Alliaria petiolata Garlic mustard. Some forgotten pots were left under a tree, they escaped the pot and began to choke out the garlic mustard. What better way to rid an area of an invasive plant than by planting a native one. Garlic mustard is a problem is many of the roadside ravines and natural areas in our community so we have decided to put Nancy’s findings to the test. We will be planting 200 plus of Packera aurea in the Ravine leading to Lake Claire on April 6th. We will plant 10-12 plants in 5-ft circles where the garlic mustard is most prolific and see if it can smother the garlic mustard growing there. We will not be pulling or digging the invasive plant so we can minimize soil disturbance and leave the seed bank buried! 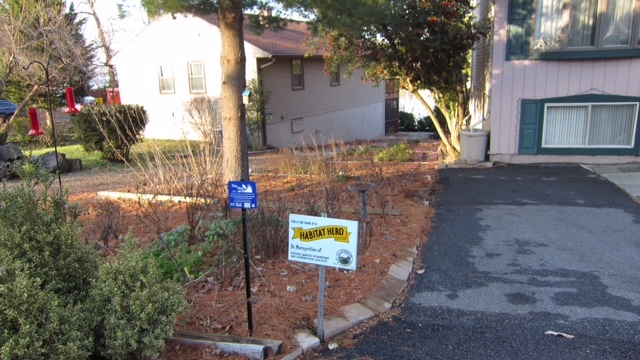 In addition to the 200 plugs at the Ravine we will plant another 100 plants as a green mulch layer at the Little Magothy Rain Garden on the same day. We are hoping to suppress the weeds that continue to cause problems. If you are interested in helping please contact me at vp@capeconservationcorps.org. Great for Scouts, NJHS or NHS hours or just because! And finally check out Thomas Rainer and Claudia West’s book “Planting in a Post-Wild World” for a great description of green mulch and groundcover layer. Preparing an area to install a new garden is an important step that must be done with care and consideration. The site needs to be clear of all existing vegetation in order to minimize weed growth. How you prepare the site will affect the environment and the success of your garden. There are many weed seeds hidden in the soil. Once the soil is disturbed and the seeds are exposed to sunlight, they will quickly sprout and take over the area making establishing your plants more difficult. One of the worst things you can do is till the area as this will quickly bring dormant seeds to the surface. We will examine four methods to prepare your site to minimize disturbance and be safe for the environment. Even though synthetic herbicides such as Round-Up are effective and cheaper than organic herbicides their long term effects can be devastating to the ecosystem. The process of site preparation should not be rushed; don’t be in a hurry to plant or sow your seeds. The better prepared your site is the less time you will spend controlling weeds in the garden down the road. Smother method is the process of using organic material to kill the vegetation. You will need some basic tools such as a wheelbarrow, mower, shovel and rake in addition to newspaper, cardboard, organic product and mulch. Start by mowing the area in the design you wish the garden to be, cover with 4-5 layers of newspaper, then 1 layer of cardboard, spread weed free mulch over the top and level it off. The next step is the hardest-let it sit for 3-12 months! I like to either start the process in early spring and plant in the fall or prep in the fall for spring planting. Once you are ready to start planting, cut a slit in the cardboard and newspaper if it is not fully decomposed and plant directly into the hole you formed. Tip: do not use plastics or other non-organic materials that will not decompose over time or add nutrients to the soil. They can also generate too much heat, killing the good soil organisms. To speed up this process you could spray the area with a non-synthetic natural herbicide prior to layering the newspaper. Strip method involves removing the vegetation, including the roots with a sod cutter or hand tools. This method can be a little costlier if you need to rent the tools but it allows you to remove a large area of vegetation quickly. The composted sod becomes rich soil that can be used in other areas as well. Start by defining the shape of your bed using a garden hose, paint or flags then strip the vegetation in your area with the sod cutter to remove it—composting it. Apply a natural herbicide to any new growth. Tip: you can use the smother method to prevent the re-growth if you are plating plugs or plants, not seeds. 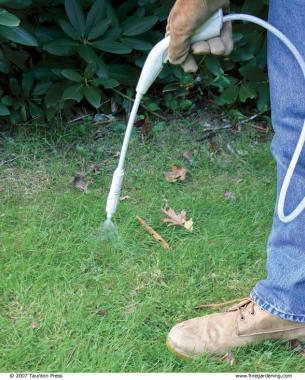 Spray method uses non-synthetic, natural herbicides to kill the vegetation. You will need a tank sprayer, safety glasses, gloves, dust mask, spreader and a chemical safe measuring cup as well as Colorant, blood or alfalfa meal, water and herbicide. There are several benefits to this method, including being able to cover a large area, and when used on slopes it can diminish erosion. The negatives are cost (a concentrate can save you money), and you may have to apply up to 6 applications and it still won’t kill certain vegetation, including woody plants. Once again stake your design, mix the concentrate with water, mixing only what you will need for the measured area, spray evenly and repeat until all vegetation is killed off. Now you can plant! Examples of natural herbicides are Burnout, Matran, Scythe, and Natures’s Avenger. Speed is the final method; it involves stop mowing and plant directly into the lawn. With a few simple steps to avoid soil disturbance you can begin planting immediately with this low cost, environmentally friendly method. This method works great if you are trying to establish a meadow. Select your plants, dig a hole about twice the diameter of the pot, shake off the loose dirt, place the plant in the hole and fill it with the soil from the area. There is no need to amend the soil if you are choosing native plants, they do not need it! All it will do is encourage strong growth of the weeds. Right plant, right place. You can mulch deeply around the plants in the beginning until the plants begin to establish themselves and grow together to form “green mulch”. As always, I encourage you to choose native plants to add to your newly established gardens as the local fauna has co-evolved with these native plants over thousands of years and they depend on each other for their survival. You may see native pollinators on a non-native plant but many times it is not getting everything it needs nutritionally from that plant—like when we eat ice cream and other junk foods. Your landscape can provide two things living creatures need, food source and a place to live, make it the best environment for them to not only survive but thrive in. Please choose the best plants for this-Native Plants. If you begin your site prep this spring it will be ready for fall planting. You can stop by Cape Conservation Corps annual Fall Plant Fest for a great selection of native plants at low prices and speak to the many experts we will have on hand to answer your questions. Happy Planting! Our fourth Habitat Hero winner is Bill Rappoport, a Cape Conservation Corps board member and active volunteer with CCC. Bill has spent the better part of 2018 installing a Milkweed Garden and converting his yard to native plants. In addition to the many pollinator friendly native plants he has included several species of native milkweed. Milkweed is he host plant for Monarch caterpillars, meaning they can only lay their eggs on milkweed as that is what the caterpillars eat when they hatch. When the time came for “fall clean-up” Bill took what I call the Lazy Gardener approach and left the stems standing throughout his garden. By leaving the stems he is allowing insects to safely overwinter in the pith of the stalks. This spring, the later the better, Bill will cut the stems back but leave 12-18” still standing as many of them will still house those insects. Once the garden begins to pop up and green out you will not even notice those stems but it will be noticeable to our beneficial bugs. In time the stems will break down and add organic matter (natural mulch) to the garden. Another “lazy gardener” trick Bill has done is to leave many of his fall leaves in place or rake them into garden areas. The leaves also make a perfect winter home to insects. You will often find birds picking through the leaves to make those insects a tasty meal. If you are lucky enough it may attract a Northern Flicker to this backyard buffet! A “messy” yard should not be viewed in a negative light, it actually provides the right habitat for so many of the creatures we want to attract: those that benefit our gardens. If we rake away all the leaves and cut back the stems we are disposing of next year’s butterflies and beneficial bugs. Leaving areas of your yard untouched you will also be providing habitat or shelter for a variety of birds and other wildlife species. A good compromise if you don’t want the “mess” in the front of the house is to tidy up your front gardens and leave the back as untouched as possible. Let the leaves lie, the stalks stand and leave some undisturbed bare soil for our many ground nesting native bees. If the plant material is diseased, remove it but if it is just dead let it decay naturally, adding nutrients to the soil as it does. This spring when Bill goes back to work on his butterfly garden he will be richly rewarded by his lazy approach to gardening. He will have preserved the larvae, egg masses, hibernating bees, dormant spiders and loads of other hibernating insects. These beneficial bugs will emerge in his garden ready to pollinate his plants, destroy garden pests, nourish the baby birds and provide months of enjoyment as they flit among his native plants. Native Grasses and sedges amongst which so many have attractive foliage to add winter interest as well as habitat and food source for insects and birds. CCC is fortunate to have a strong group of volunteers who come out to support our restoration efforts of the natural areas of our community. In order to continue our efforts of restoration we also rely on funding in the form of donations, grants and memberships collection. Your annual $20 CCC membership goes to supporting our restoration projects. Thank you for your continued support of our mission to ignite community pride in our native landscape through projects that promote stewardship, create healthy natural spaces and champion swimmable, fishable waterways. We try to meet our vision through understanding our impact on the environment and quality in CSC, eliminating storm water runoff, controlling erosion, eradicating invasive plant species by replacing them with native plants. Please mark your calendars for this remarkable lecture and stunning slides with Sam Droege on Friday March 22nd 7:00 PM (doors open 6:30 PM). Sam is wildlife biologist at Patuxent Wildlife Research Center. Sam will be talking to us about the importance of native bees in our ecosystem and how to identify and name these beneficial insects. The pictures contained in the slide show are truly remarkable and not to be missed. Light refreshments provided. Please bring your own adult beverages. Admission is free! Let’s keep talking about grasses. In the last blog I discussed how grasses are often overlooked and underused in our landscapes and some of the benefits of using native grasses. 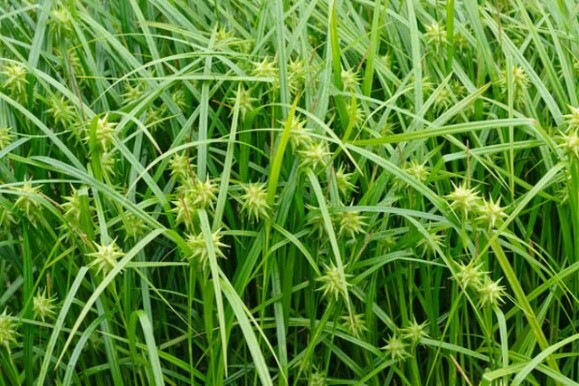 I would like to talk about a group of native grasses that has a species for just about every growing condition—Carex. I touched on them briefly last month but let’s take a look at some Maryland Native Carex that will add texture and beauty to your gardens! Carex pensylvanica Pennsylvania sedge is a low growing grass with a tough disposition and spreading habit that makes an excellent shade groundcover. 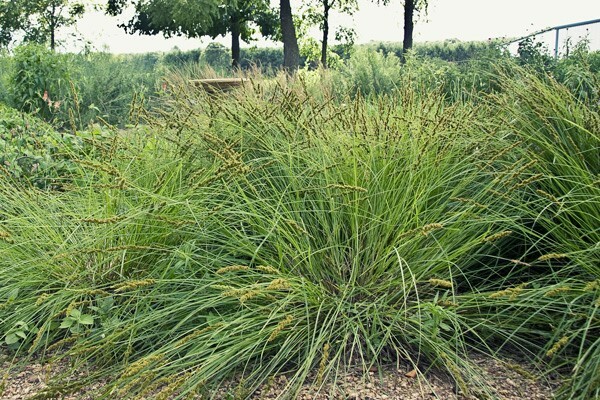 This ½-1’ sedge prefers part- to full-shade with dry to medium moisture. It can tolerate moisture so it could even be used in a rain garden in dappled sun. The soft, delicate arching leaves provide wispy clumps that spread and naturalize your space. If you are looking for a lawn alternative, something to work in those dry, shady spots of Cape St Claire, this is the sedge for you! Carex albicans White-tinged sedge is another native grass that would work well in the Cape with its part shade to full shade, and low moisture requirements. It will tolerate dry and even drought conditions. Albicans will spread through rhizomes and self-seeding. 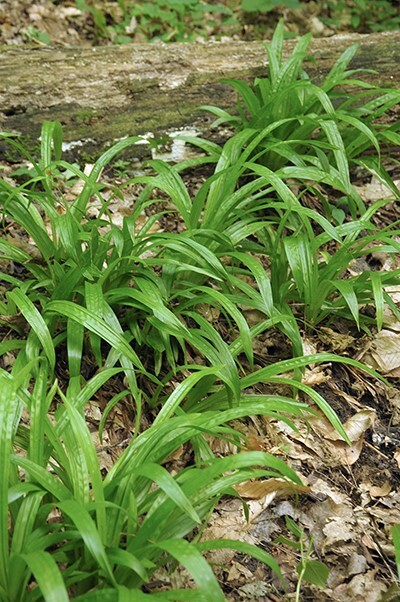 The 5-20’’ tall clumps have narrow, upright-arching bright green blades and are typically up to 16” wide. They work best when planted in mass for a full foliage effect and offer year round interest. I have planted this around the base of some shrubs to fill in a as groundcover and control weeds. Carex appalachia Appalachian sedge is one I have used to stabilize a slight slope in the back part of my yard that has shady and dry conditions. 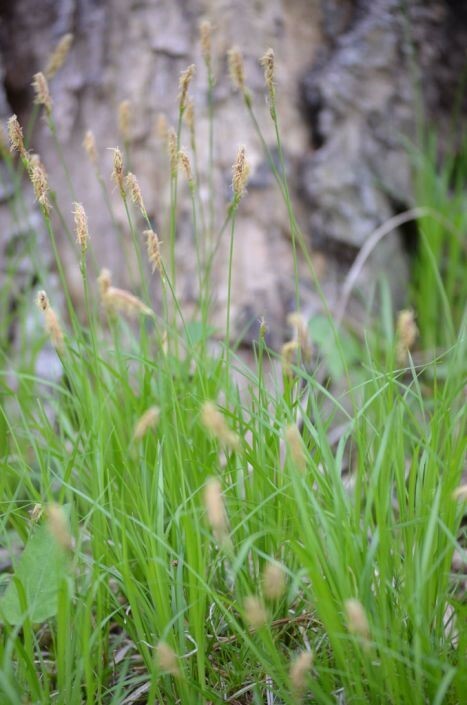 This sedge grows in dense mounded tufts that sweep along the slope with its willowy foliage. 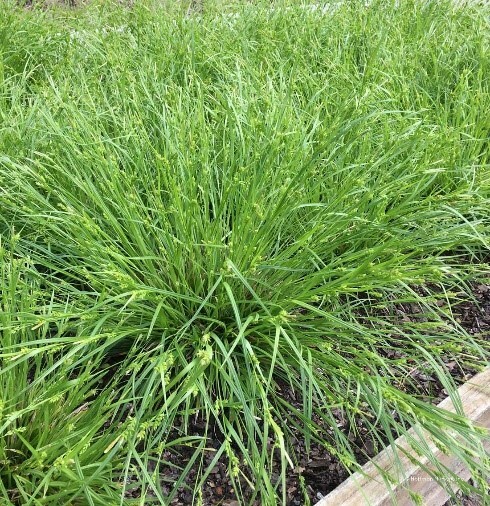 This ‘moisture challenged’ sedge is another one that can be used to replace lawn in your hard to grow areas. 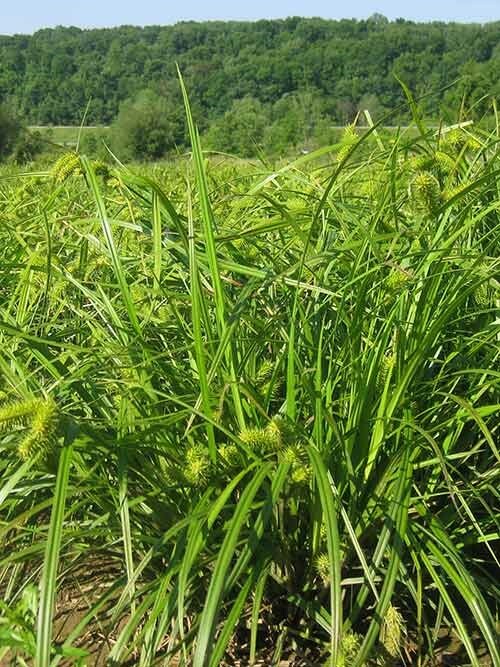 Used as erosion control, as a ground cover, in a rock garden or low maintenance beds this sedge will also provide a nectar to native insects, seeds for birds, and as a host plant for several butterflies. 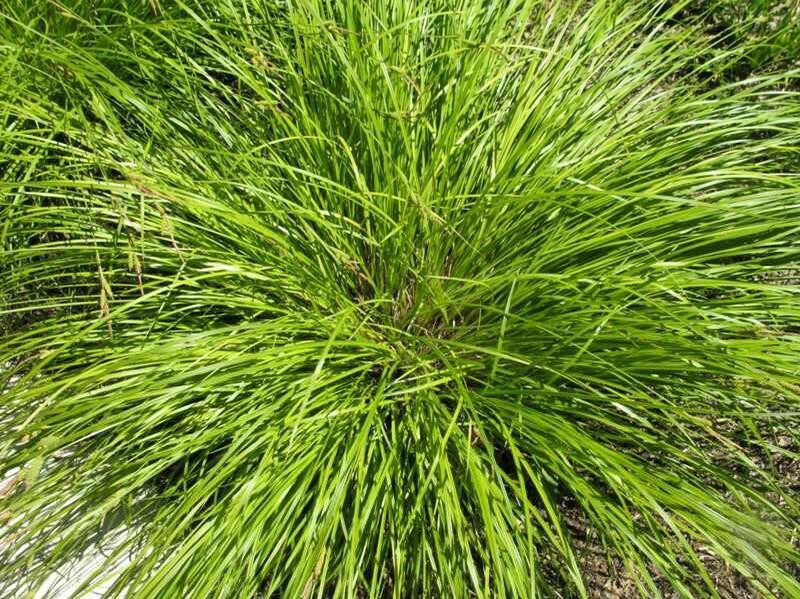 Another great choice for your landscapes is Carex amphibola Creek Sedge, this highly adaptable, shade tolerant grass prefers medium to moist, even wet soil. Bright green mounds form attractive fountain-shaped clumps that can be very ornamental. 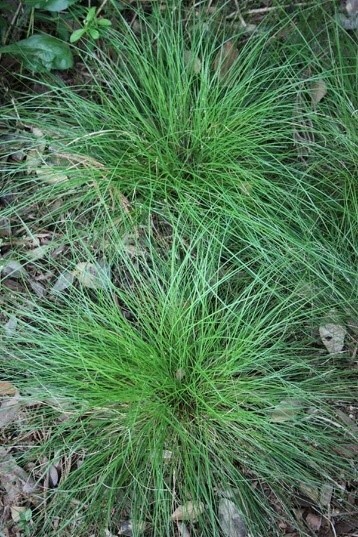 Use this sedge in shade gardens, rain gardens (can tolerate some sun if it stays moist), meadows and along streambanks. It is deer resistant and a host plant for many skipper butterflies as well as food source for turtles (seed heads). While we are still in the shady moist areas of the yard, let’s talk about Carex plantaginea Plantainleaf sedge. A 1-2’ tall sedge with red-purple at the base and bright green, broad evergreen leaves up to 1” across. This stunning sedge prefers the shady, moist, rich woods areas. I planted it in a wet spot of the yard this fall and cannot wait to see how it performs this coming year. With its bright foliage this would make an attractive ornamental plant but it offers wildlife benefits as well, it is a host plant to several woodland butterflies and the seeds are food source for woodland birds. This low maintenance plant will also add texture to shade gardens, act as a groundcover or a woodland trail border. Carex grayi Grays sedge was one I found recently that work well in moist to wet shady conditions. It forms slow spreading clumps with narrow shiny, upright semi-evergreen foliage. The seed head forms a spiked club that turns green to a golden brown which makes for an interesting addition to the winter garden for year round enjoyment. Carex glaucodea Blue wood sedge is another interesting clump forming ground cover that works in average to moist conditions in shade to part shade areas. It can also tolerate some drought conditions. Blue wood sedge is typically found in wet woodlands or swampy grounds. 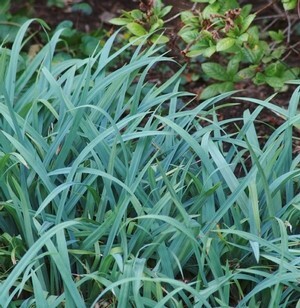 The evergreen foliage is a fine-textured, narrow grass-like blue-green leaf. 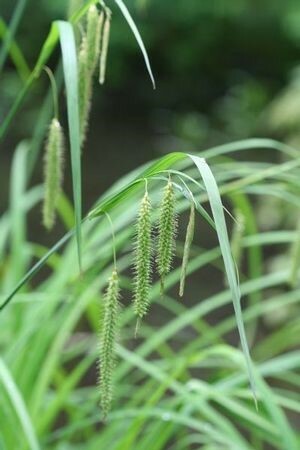 This sedge would well in small group in a woodland garden, shade garden or rock garden and makes a lovely edging along a pathway or around a pond. Carex crinita fringed sedge works well in moist to wet up to standing water full sun so another great rain garden or pond addition or low lying areas of the yard. It can even tolerate drier shady spots. This short creeping evergreen sedge grows in dense clumps 2-3’ tall which sends up an arching flower in late spring. Fringed sedge has similar wildlife benefits as the lurid sedge—another favorite nesting spot of the Sedge wren as well as a host for Eyed Brown butterfly, skippers and moths. The emergent Carex stricta Tussock sedge is a favorite of mine around my pond. This moisture, sun loving sedge forms colonies with underground rhizomes. Its fountain like bright green foliage makes a beautiful addition to wetlands, bio-swales, and storm water projects. And finally, Carex vulpinoidea fox sedge thrives in part to full sun wet areas. 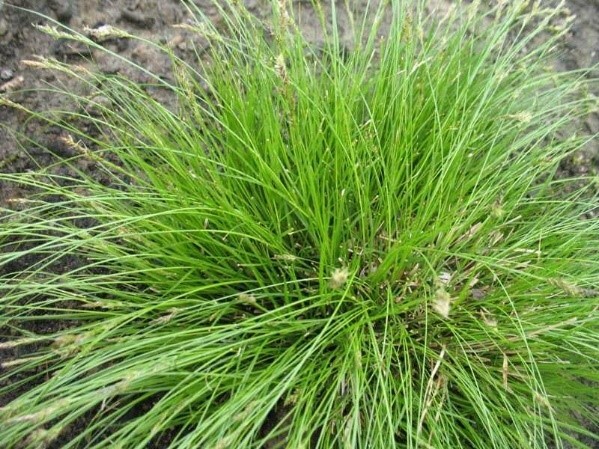 This sedge is useful for wetland restoration, erosion control, storm water management and wildlife gardens. The delicate arching foliage is mostly evergreen creating year round beauty in the landscape. The seed and rising spike turn a deep brown color in autumn. I hope you will consider using a Carex or two in your landscapes to add texture, color and movement to the garden. Many of these sedges are beneficial to wildlife by providing both coverage, and food for birds or caterpillars. The benefits to storm water management, erosion control and wetland restoration are also an important reason to use these beauties.